“Souse & Conquer” – what a strategy to win a race and it works! On July 16 and 17, our club will be invaded by a group of Cal 20 sailors from Kaneohe Yacht Club on the Isle of Oahu in Hawaii. Their intent will be to win the 11th Annual Team Race between KYC and the SF Bay Cal 20 Fleet. Their strategy (devised in 1971 as above) will be the same, but then we have plans of our own!! In 1971, thanks to the efforts primarily of two club members, John Poletti and Bruce Sams, the team races began between the KYC and the SF Bay Cal 20 Fleet. It was a happenstance of vacations, too many Mai Tais and love of sailing in those warm Hawaiian waters that brought the whole concept into reality. The first year, we journeyed to Hawaii, were met at the airport with station wagons and a washtub full of Mai Tais and were thoroughly trounced on the race course – but what a way to go! The wonderful hospitality encountered their established traditions that have ensued through the years. In 1972, they first came to our area and the SFYC graciously hosted the event, provided them picture-perfect Hawaiian weather for the practice sessions (bathing suits were the attire), lots of Mount Gay rum the night before the first race and fog, 40 knots of breeze and 6 knots of flood for the races. They learned on that trip all about going from Knox to Harding on a flood, and we won the trophy! If memory serves correctly, Bobby Holm was our clever race committee chairman who devised that course – many thanks! With the exception of 1982, the race has been held every year, alternating locations with the advantage usually going to the home team. 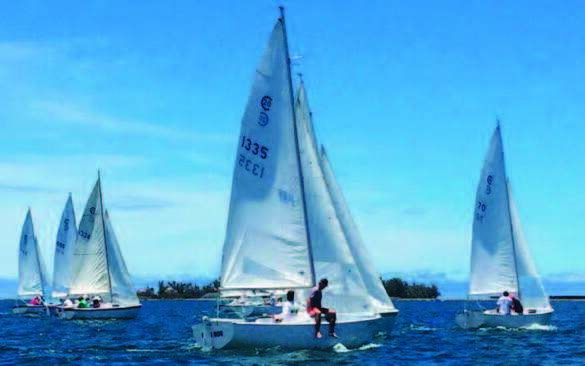 This July will mark the fourth time our yacht club has sponsored the even in the 12-year-old series. For those of you unfamiliar with Team racing, it is an entirely different animal from class racing. Instead of every man for himself, team members try to help one another during the race. The individual winning the race does not matter as much as the team score (reverse scoring is used) so that it is not unusual to see a first place boat turn back to help a buddy; all of which provides exciting spectating. Each team is comprised of four boats, with skippers and crews determined by the top season finishers of last year. We are planning to have spectator boats available for anyone wishing to go and watch a different way of racing. Representing SFYC will be Jerry Leth and Marcia Peck. They and the home team could use some cheering on!! The schedule of events is as follows: The Hawaiians will be arriving all during the week of July 11, so if you see some suntanned people shivering on our deck and drinking Mai Tais, go up and say Aloha. Thursday, July 15, will be practice day (they are no longer fooled by bathing suit weather or Harding Rock) and Thursday night, there will be a private progressive welcoming party on the Lagoon, where the famous “S & C” strategy will be employed. The races will be Friday, July 16 and Saturday, July 17, starting time at 11 a.m.